Summer flying, by Mike Feeney. David O'Hare, Associate Professor of Psychology at the University of Otago takes a look at training aeronautical skills in virtual environments. Peter Clark finds out why Air NZ's pilots are already loving the Beech 1900D, while Dave Paull traces the development of the type. Peter Clark talks to Helilink and retraces New Zealand aviation's first steps at Mechanics Bay. 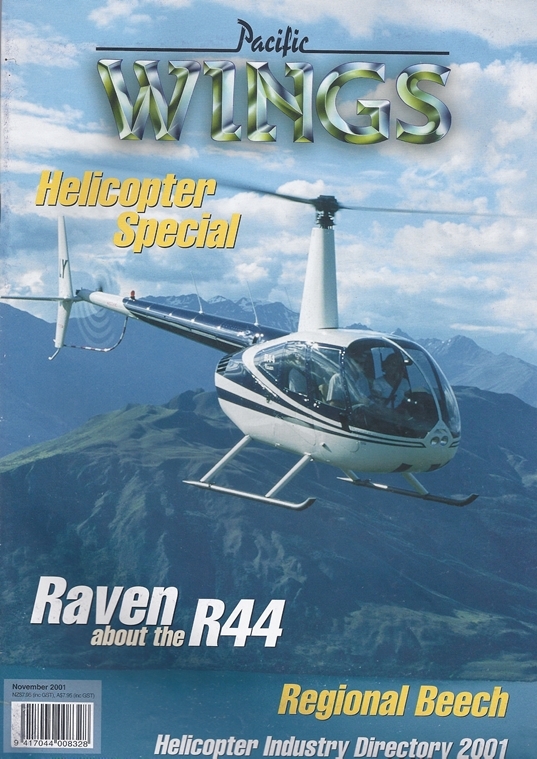 The editor evaluates the R44 Raven and discovers that perception can be far from reality. Murray E Kirkus remembers the little sport aircraft the Tipsy Nipper and the one that flew in New Zealand's skies. David Stuart recalls how he got caught between layers of sloping cloud - and how he got out of it. By Max Pudney talks with ex-Meteor pilot Sqn Ldr Frank Welford about the types less appealing characteristics.